Liverpool centre-back Virgil Van Dijk has jumped to the defence of misfiring winger Mohamed Salah after his ineffective display against Chelsea. The Reds secured a 1-1 draw at Stamford Bridge on Saturday from the jaws of defeat after falling behind in the first half courtesy of an Eden Hazard strike for the hosts. Jurgen Klopp’s men huffed and puffed thereafter, but Salah, Firmino and Mane all endured a frustrating afternoon in front of goal before Daniel Sturridge came off the bench to score the equaliser late on. The Englishman’s goal came out of nowhere as he smashed the ball into the top corner from 25 yards out to save his team after it looked for so long as though Liverpool would leave London empty-handed. Salah, in particular, seems to be struggling with the weight of expectation after his 44-goal season last term, having only managed to find the net three times so far at the start of the 2018-19 campaign. 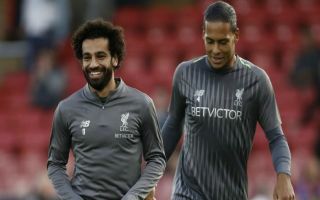 However, according to Metro Sport, club teammate Van Dijk has attempted to reassure his colleague with his comments on Monday, as he told reporters: “We are seven games in and Mo’s working hard. “He’s still the same Mo, and he needs a bit of luck as well. “I’m not worried at all, and he should not be worried either. We do it all together, we’ll always be there for him and he’ll deliver as well. Liverpool’s Egyptian talisman will have another chance to prove himself on Wednesday night when the Reds take on Napoli in the Champions League in Italy, which will surely be a tough game away from home in Group C.
Klopp’s side secured their first three points in Europe this season against Paris Saint Germain on matchday one and if Salah can reproduce his best form there is every chance of the team earning another win against top-class opposition in midweek.